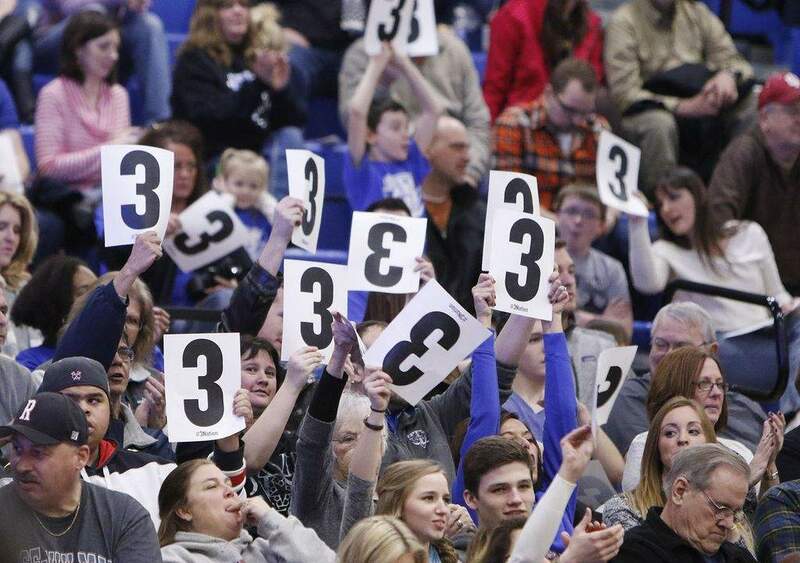 FILE: IPFW fans hold up "3" signs in celebration of Max Landis, who led Division I in 3-point percentage at 50 percent. Indiana University students enrolled in what is now IPFW will not be able to participate in Division I sports when the school splits next year. That policy is one of many approved Friday by trustees for Indiana and Purdue universities, which have jointly operated IPFW for more than 50 years. Spelled out in legal detail, the agreement addresses how the universities will cooperate through July 1, 2018, when IPFW officially becomes two schools. It also outlines terms after the split. Division I will be Purdue's domain. The 77-page agreement, with appendices, covers responsibilities for financial aid, faculty transfers between schools, property, the campus library, its bookstore and even how the name “IPFW” can be used in the future. The trustees approved the agreement in separate board meetings. Buried deep in the document is the fact that although IU Fort Wayne students will be able to participate in athletic events, recreational activities and intramural sports, they will be barred from Division I. National Collegiate Athletic Association rules prohibit players from two different schools competing on one team, IU spokeswoman Margie Smith-Simmons said in an email response. Five of about 240 IPFW student-athletes are in health science programs, which IU will take over, IPFW Athletics Director Kelley Hartley Hutton said in an email. Three could need a waiver to remain eligible for athletics. The Mastodons will remain the name of the Purdue Fort Wayne teams, but team colors could change as part of a brand marketing study underway, Purdue spokeswoman Julie Rosa said in an email. Purdue is the managing partner of IPFW. Late last year, IU and Purdue trustees approved an agreement for IPFW's governance that establishes two institutions beginning July 1, 2018. IU will have a lower profile and focus on health sciences. Purdue will handle all other academic programs. When realignment is complete, IU expects to enroll about only 1,100 students. Total IPFW enrollment last year was about 12,000 full- and part-time students. In a joint statement Friday, the universities said more than 200 faculty and staff members from Purdue, IU and IPFW have been involved in the transition planning. Their aim is to provide a seamless student experience; shift faculty members between institutions with their tenure, rank and seniority intact; prevent duplication of missions; arrange for a smooth transfer of libraries to Purdue; and administer endowments and gifts in accordance with donor intent. In many ways, the agreement clearly spells out ways IU will pay Purdue to provide that seamless student experience, said Jeffrey Malanson, presiding officer of the IPFW faculty senate. The Program Transfer Agreement signed Friday sets a path to erase most remnants of IPFW, opened in 1964. Under the agreement, each school will be responsible for collecting its own tuition and fees. As of July 1, 2018, Purdue will offer IU students “general education classes, service courses and programs required by such students” to fulfill their IU degree requirements. The agreement sets out how IU will pay Purdue for those courses. It also establishes a process for IU to inform Purdue of which courses its students require. The initial course list will be provided to Purdue by Sept. 1 this year. Those in Purdue general education courses will have access to Purdue's Blackboard Learn online learning management system or a similar system. IU students will have access to the Waterfield Student Housing complex and other student housing under the same terms as Purdue students. Students, faculty and staffers will have access to the same parking lots and garages. IU and Purdue students will be able to join all student life and leadership organizations. Students in both schools will have access to the library, health and wellness counseling services. The ownership of the Helmke Library will be assumed by Purdue. Purdue will maintain its bookstore vendor contract but will not be required to provide textbooks and other supplies “to any IU-delivered course, program, degree or department.” IU would have to get its own vendor for that. IU students will be admitted using admission standards determined by IUPUI. Purdue and IU will administer their own student recruiting, application process and student transfer procedures. Each university agrees not to offer courses or research that fall under the other's academic mission. Purdue will manage the Fort Wayne campus, including the Technical Assistance Program next to campus and the Cooperative Extension Service facility. IU will control its medical school on campus. IU will take responsibility for faculty transferring from the Purdue side and will provide the same salary and benefits. IU will identify all full-time administrative and clerical staffers it wants to employ. Purdue will consult with IU in approving hiring that affects the IU mission during the transition year. The schools will identify personal property to transfer or sublease to the other. The land underneath the medical education building will go to IU, and the land under other campus buildings goes to Purdue. Undeveloped property and parking lots will continue to be owned jointly. The two universities will have separate community advisory councils “consistent with the function historically served by the IPFW Community Advisory Council.” The IPFW Foundation will exist to primarily support Purdue. School academic calendars “should match as closely as possible in order to best serve all affected students,” the agreement states. Many IPFW faculty members are still disappointed that IPFW is going away but have accepted it and are trying to make the best of the new arrangement, said Malanson, the IPFW faculty leader. “As someone who was skeptical as to how all of this would work … overall I've been pleased with how the universities have worked together and how Purdue has been really looking out for IPFW's best interests in trying to usher this through,” Malanson added. In an email to the campus community, Chancellor Vicky Carwein called the agreement a critical step in the realignment. “This university is proud of its legacy and remains committed to removing barriers to learning and developing innovative ways to provide a world-class education that makes an impact in northeast Indiana – and beyond,” her statement said.